Sometimes, though, a connection comes out of nowhere. It’s the cosmic unconsciousness at work. I mentioned recently that I’d stumbled onto the music of Abigail Washburn, a banjo player who mixes Americana with a basket of Asian influences. Back in 2010, I’d taken a chance on an sharp-looking CD by Wu Fei, who plays the guzheng, a Chinese stringed instrument similar to the Japanese koto. The cover caught my eye; the presence of Carla Kihlstedt and Fred Frith is what really sold me. Not only have these two played together, but they also know one another going quite a ways back. They’re even reuniting for a one-off concert on Oct. 17 in New York. Yes, it’s all part of the cosmic unconsciousness. By the way, it turns out Wu Fei is quite the bluegrass picker. Early on in “SGLT1,” Teddy Rankin-Parker‘s cello tells you a lot about this improvised trio session. Scraping the bow so hard that it’s sometimes barely able to move, he emits metallic whinnying and teeth-grinding sounds, like industrial machinery being towed across a factory floor. Rent Romus, meanwhile, chops away at clean, stern saxophone lines, cementing the mood, enhanced by the pockets of time where Rankin-Parker moves into jazzy bass-like work. Drummer Daniel Pearce sustains the energy with soft patters and fills. Taking its name from both the Irish wind god and the field of genomics, LiR is a 35-minute mini-album or maxi-EP, consisting of five inspired pieces from a live set. Rankin-Parker and Pearce have recorded and performed as a duo and as part of Broken Trap Ensemble. Here, they’re matched with Romus to put a tinge of jazz onto their edgy explorations. LiR is full of buzzy, noisy improvising, but the trio is also willing to build from elements of melody and swing. “GLUT4” opens with crystalline pinging on cello and some swinging jazz from Romus, played in a choppy, catchy vein. The short, closing “mRNA” is almost like a metal song, with deep cello pulses like power chords and crashing energy all around. Quiet phases get their turn too, usually after a tumult like the gloriously bubbly opening of “tRNA,” where Romus flutters noisily on what sounds like an exotic reed instrument (but might be just a sax played with extra rasp). That track later settles into a near-trance mode, with a fast cello pulse against slow Romus solo, a somber soliloquy built from rich sax tones. My daughter and I compared notes after seeing Madalyn Merkey and Tujurikkuja, two acts that were helping to close out the San Francisco Electronic Music Festival. I felt that Merkey’s piece had more activity, while Tujurikkuja’s was more about drones and walls of sound. In terms of volume, I could deal with Merkey’s piece but wished for earplugs during Tujurikkuja’s. My daughter had the opposite reaction: Her ears had a harder time with Merkey. And between the two pieces, she found Tujurikkuja’s drones more fascinating, while I’d thought Merkey’s piece was the richer experience. It just goes to show how differently music can be perceived. According to the program notes, the bulk of the piece was built of tones that were changing, according to pre-set rules, during the course of the piece. The music did seem to move in phases, clustering certain “types” of noises while also never overlapping too many at once. One phase I remember in particular had springy, squelching sounds like small electronic animals making their puzzled way around the landscape. Markey built the piece for a 4.2-speaker setup to create some stereo effects — side-to-side swooshes, for instance. Being over to the side, we lost some of the effect, but we could still catch the sense of an added dimension. Tujurikkuja (the J’s are pronounced like H’s, Spanish-style) put a descriptive poem in the program described a scorching hot desert (First clue: The opening line, “It is hot.”) But my daughter and I found the music evoking wide, dark caverns and glassy walls of sound — it felt cold, not in an emotional sense but in a literal sense. Either way, theirs was a more drone-based set, although there was plenty of sound-shifting, with new elements coming and going. They ended it by simply walking off the stage, allowing the final droney buzz to continue on its own, in darkness, until they cut it off remotely. These were two thoughtful and contrasting pieces and made for a good program. My daughter admitted she wouldn’t seek out this kind of music, but she paid attention through both pieces, and we talked about both of them quite a bit afterwards. Therein lies the real power of music and the arts. I am not proud of this, but: The only show of the San Francisco Electronic Music Festival that I attended was Sunday night’s closer, the one where clipping. performed. 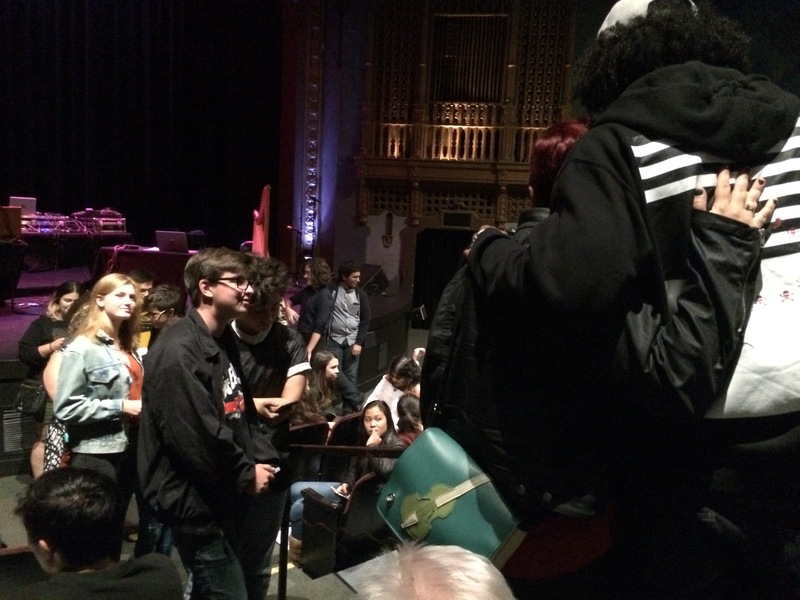 Predictably, at least half of the apparently sold-out crowd at little Brava Theater was there to see that band, specifically rapper Daveed Diggs. And, yes … my daughter was one of them. I had fun. But as you might expect, it wasn’t quite the same experience SFEMF normally delivers. The second half wasn’t, anyway. The first half featured electronic pieces by Madalyn Merkey and Tujurikkuja, and I’m grateful to the clipping. fans for being respectfully silent during that set. Those who couldn’t deal with it quickly decamped to the lobby, which was a distraction but was the right thing to do. Many of them seemed willing to accept the music on its own terms, though, and they applauded enthusiastically, as did the “usual” SFEMF-goers. The clipping. set was different. After one or two songs, fans rushed the stage, dancing and jumping in full hip-hop mode. My daughter and I had fun (and stayed in our seats, for a better view) — but any pretense about savoring experimental electronic sounds was gone. The show had been taken over, and it was my turn to accept someone’s music on its own terms. Nothing against clipping. or Diggs. They were doing their normal thing, and they’re very good at it. It’s great that SFEMF experimented with pop music, but the show was overrun by one factor no one could control: Diggs’ notoriety from Hamilton. We got a taste of that before the show, when Diggs appeared near our section of the audience to greet friends (the guy siting next to me was clipping. bandmate William Hutson, it turned out). It wasn’t long before one teenage girl asked for an autograph, and soon a line formed. It’s in the photo, above; Diggs is on the far right in black-and-white stripes. Warm and generous, he worked through a good portion of the line, at one point remarking that the evening wasn’t meant to be all about him. He finally had to excuse himself, promising he’d hang around after the show — which he did. Regarding the music, I’m going to use a separate blog entry to discuss the Madalyn Merkey and Tujurikkuja pieces. They did fine work which shouldn’t be overshadowed by all the words I’m devoting to clipping. But I do want to talk about clipping., because their live act felt so different from their records. To me, the CDs have an ominous edge, defined by not only the noisy backing, but also the lurking sparseness. The sounds are crunchy and aggressive, but they leave enough blank space for a sense of isolation and dread. The live show was, well, a hip-hop show. Compared to the CDs, the sounds were infused with more melody and more of that thump-thump beat, and Hutson’s fellow DJ, Jonathan Snipes, took at least one crowd-pleasing solo. While Diggs’ delivery was still edgy and his lyrics dense with political and social tension, the show became a dance party, as hip-hop tends to be. I found myself geeking out about the fact that a couple of the raps added up to 6/4 time. That included the final track, “A Better Place,” which was surprisingly upbeat and tonal, ending with a grand sunburst of noise. To show off, I’ll add that the song mentions “bodies and cities,” confirming that the EP’s title comes from an unfinished Samuel R. Delaney novel. I wouldn’t have sought out clipping. on my own, so I’m grateful to SFEMF for exposing me to something new. I hope some of clipping.’s fans went home thinking the same thing about the other acts. If so, maybe the experiment worked after all. In June, Lisa Mezzacappa performed three concerts in Europe with different ensembles, showing off ORGANELLE, her latest concept for an improvising ensemble. Mezzacappa has initiated so many interesting projects over the years. The electro-acoustic chamber ensemble Nightshade comes to mind, and more recently she adapted her Bait and Switch quartet for a concept called avant-NOIR. Last year’s Glorious Ravage was an ambitious and successful project combining composition, history, narrative, and visual elements. Parts of it are preserved on the gloriousravage.com website, captured with professional photography and video. ORGANELLE is a “set” of pieces inspired by diverse scientific processes – some enormous and unfathomable, others impossibly microscopic – that form a whole through the insights and explorations of fantastic improvisers. The composition draws its musical ideas from the different ways that the human body, the natural world, and the cosmos mark the passing of time. The rhythms, the musical relationships, the melodies, and structures in the work are each connected to a theory of cell biology, astrophysics, paleontology, zoology, or neuroscience, exploring these otherwise-imperceptible phenomena through sound. Performances took place in Naples, Rome, and Cologne in June, and now Mezzacappa is going to perform ORGANELLE here in the Bay Area. There’s an open rehearsal on Sunday, Sept. 11 at the Berkeley Art Museum, followed by the full performance at the museum on Friday, Sept. 16 (a show that includes ’90s dub/funk stars Broun Fellinis). It’s a busy week for Mezzacappa, who’s also performing some solo compositions tonight (Sept. 10) as part of Philip Gelb’s music and food series. (In an intimate setting, a small audience is served a vegan gourmet meal during the show — it’s an intriguing concept.) She’s also appears with an improvising quartet on a newly released CD called Shipwreck 4, which sounds really good (more on that later). Larry Ochs (sax) and Donald Robinson (drums) will play a rare show as a duo on Thursday, Sept. 8, at the Luggage Store Gallery (1007 Market St., San Francisco). They put out a CD fairly recently, called The Throne, which I wrote up here. (Was that really more than a year ago?) I also find myself thinking about Robinson’s recent duo concert with Oliver Lake — a highlight of this year’s Outsound New Music Summit. Ochs and Robinson have played together for more than 20 years in more ensembles than I can count. In the Throne writeup, I’d neglected to mention What We Live, the improvising trio (or more) spearheaded by bassist Lisle Ellis, with Ochs and Robinson. Then there’s also Ochs’ Sax and Drumming Core, with Ochs and Robinson joined by second drummer Scott Amendola. And going back to the ’90s, they were both in the Glenn Spearman Double Trio. That’s a lot of history, not to mention a nice scenic path through the last two decades of Bay Area creative music. Their show on Thursday will be just another in a long series — but in a way, it’s also worth celebrating. Here are Ochs and Robinson live from a show three years ago hosted by GRIM (Groupe de Recherche et d’Improvisation Musicales — which actually translates nicely into Group for Research and Musical Improvisation). It’s a brief excerpt with a regal, Coltrane-shaded feel. And Ochs himself has posted a track from The Throne on Soundcloud. Called “Breakout,” it’s an Ochs composition enhanced by a nice hard snap by Robinson. The San Francisco Electronic Music Festival returns this week, starting with a Thursday show at the Exploratorium and ending with a change of pace that might draw a bit of a crossover crowd. Most of the shows are at the Brava Theater Center (2781 24th Street, San Francisco). Check the full schedule for more details. Thursday, Sept. 8: The kickoff show, held at the Exploratorium, will feature Gen Ken Montgomery performing a Cassette CONcert, an idea developed by the late German musician Conrad Schnitzler beginning in the late ’60s. It’s an intriguing spin on the idea of tape music, the preconfigured electronic-music pieces that became an art form in the ’50s. In this case, Schnitzler provides a series of tapes, and it’s up to the musician which ones to play and when. This means the concert can take variable form and length (Montgomery reports of one concert that lasted 50 hours). It’s a very Cageian idea, this reconfigurable composing; it also makes me think of Pierre Boulez’s Domaines, the modular piece performed by sfSound in July. That Thursday show also includes the percussion-electronics duo IMA, who just came off a successful performance at the Outsound New Music Summit. 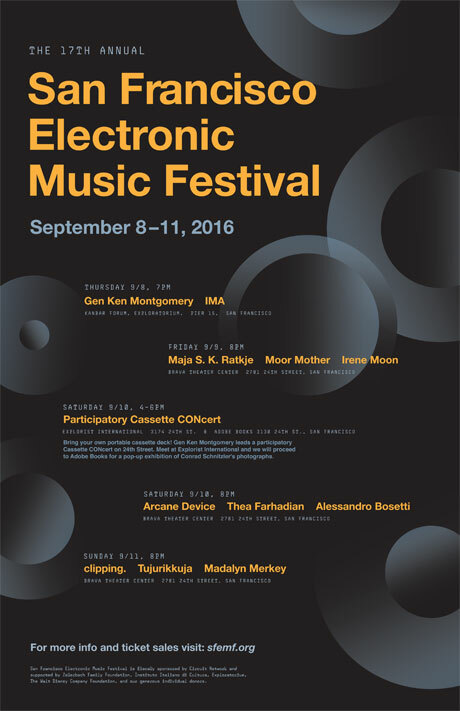 Friday, Sept. 9: This show includes composer Maja S.K. Ratkje, the Norweigan noise artist who also travels in classical-music circles. Her recently released Crepuscular Hour, a piece that includes three choirs, noise musicians, and a church organ, “seeps through the liminal cracks between light and dark, the spiritual gloaming during which living bodies and minds change their patterns of behaviour,” as The Quietus describes it. Performance photos on Ratkje’s website are stunning. Saturday, Sept. 10, 4:00 p.m.: There’s a Saturday evening show at Brava, which will include local violin-and-electronics artist Thea Farhadian. In the afternoon, though, there’s a tribute to Contrad Schnitzler happening in the Brava neighborhood. Gen Ken Montgomery will host a “participatory” Cassette CONcert, where you’re welcome to bring a cassette deck and become part of the performance. Elsewhere, there’s going to be a small exhibition of Schnitzler’s archives. These are happening at Explorist International and Adobe Books — 3174 and 3130 24th St., respectively. I don’t know which event is at which location, but Adobe Books has hosted small concerts in the past, so it might be the CONcert venue. Sunday, Sept. 11: The SMEMF guest likely to draw the most attention is an East Bay native: Daveed Diggs, performing with the L.A. rap trio clipping. (the period is part of the name). Diggs is better known for less experimental work, being one of the original stars of the Hamilton musical. As the Marquis de Lafayette, he performs some impossibly fast raps in a French accent. With clipping., the speed and energy are there, but in a darker vein — a sinister vibe with lots of F-words and some sharp political messages. The connection to SFEMF is that the backing music consists of spare, noise-based electronic rhythms — which, for me, is a refreshing change from rap’s usual course of mindless nostalgia samples and weak elementary jazz riffs. For rap fans, it’s a different sound — and for SFEMF, it’s a very experimental turn and a bit of a risk. Read more about the festival (and about clipping.) at San Francisco Classical Voice.